Change the meaning of being 35-40 and beyond! Become exquisite & daring as you fly and float in the air. 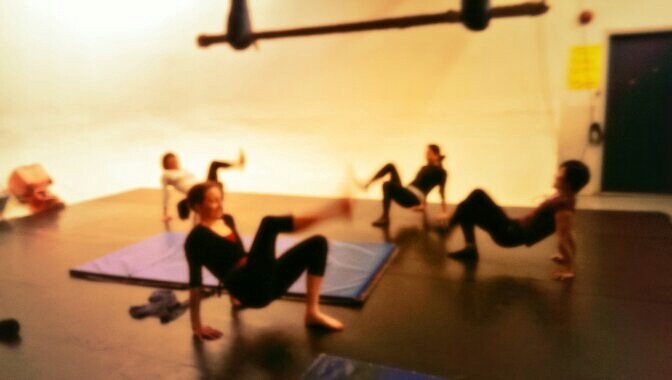 Adult group classes from age 20 , 30 , 40 , 50 and beyond ! All Classes organized from beginner to more advanced moves. With a focus on stretch and strengthen conditioning exercises and injury prevention. Educative moves will be practiced on the ground before moving into the air. Safety rigging will be discussed. Get Fit. Get Strong. Increase Flexibility. Feel Good. With Zel Tyrant, The approach is simple work hard, have fun! 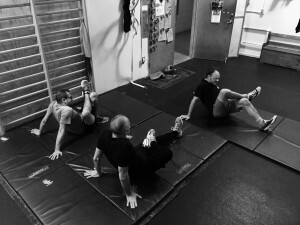 This is a bodyweight-based program with dynamic movements to increase strength and gain flexibilty. 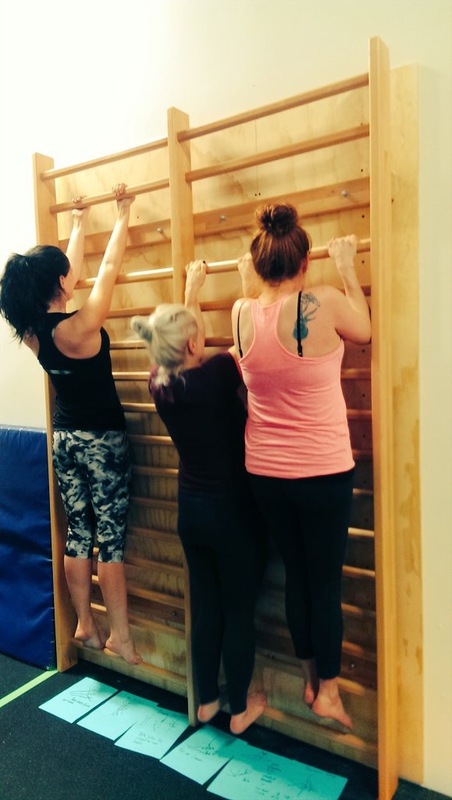 Use a stall bar and learn dynamic exercises on ground designed to tone and increase flexibility. Bring small book to track progress and track exercises as you move forward ! You’ll be amazed. Rise to the challenge! Get fit. Start now. 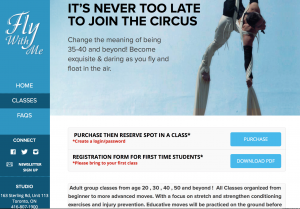 Purchase and Reserve spot Online payment On website Class page. Join us as we do our Stretch & Strength workout on stall bars, ground exercises on mats using Stability balls, resistance bands and more. *One Make-up Class per session given 24 hr notice of cancelation. 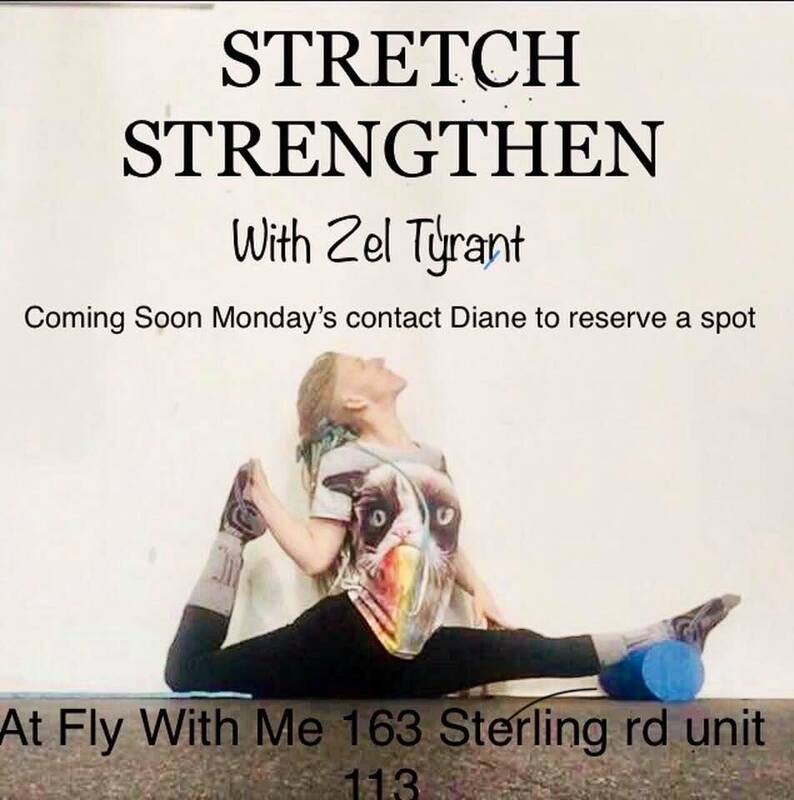 *Age Requirement: if you are under 30 years of age, and want to join a session or class, please contact Diane to discuss special admittance. *Private classes are available for $65 or $50 for students already enrolled in a class session. 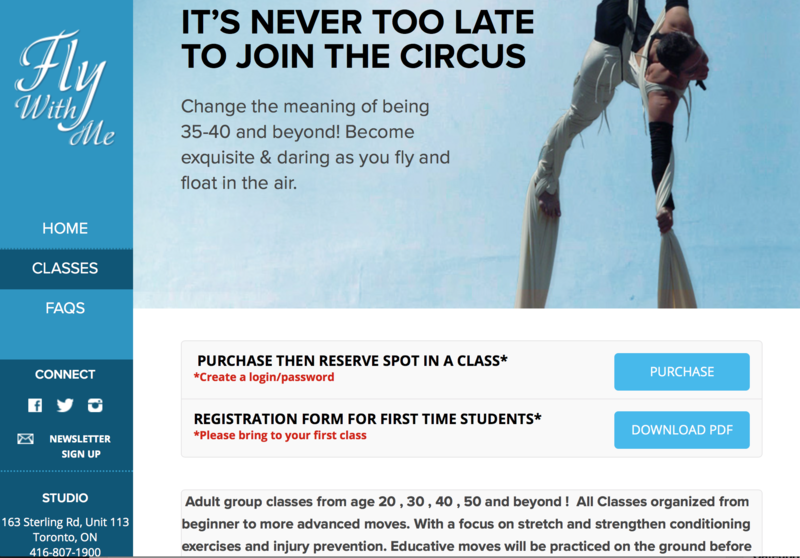 *Drop in class is available for the first class of each session at a cost of $35.. If the person wishes to continue to take classes within that session they will pay total cost of session less $35. *Must give 24 hr noticed if you need to cancel class or must pay for class in full. MONITORED PLAY TIME ! Extra day to play, practice what you all ready know and have learned in class. This is a monitored time slot with teacher. No instruction. Practice makes perfect! And makes you strong. Different time slots available on request with teacher. 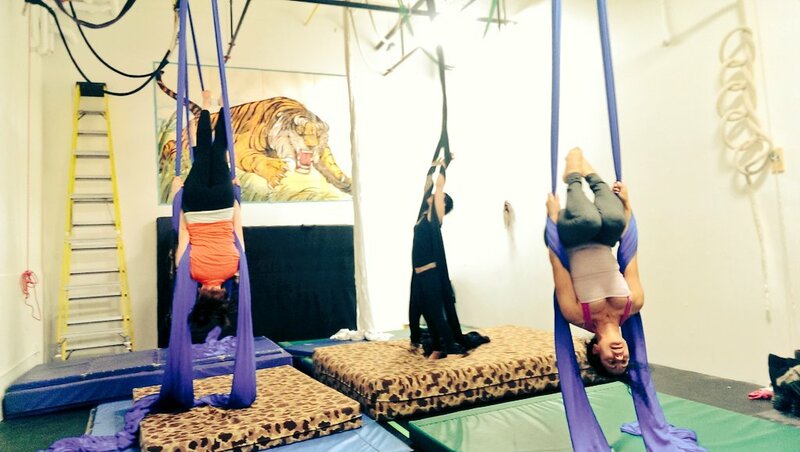 Prepare to fly by stretching and strengthening your body on mixed apparatus circus equipment doing fun partnering exercises in a circuit training format both on the ground and in the air. Familiarizing you with each apparatus as you have fun with strengthening, focusing on flexibility, power, core stability and endurance. 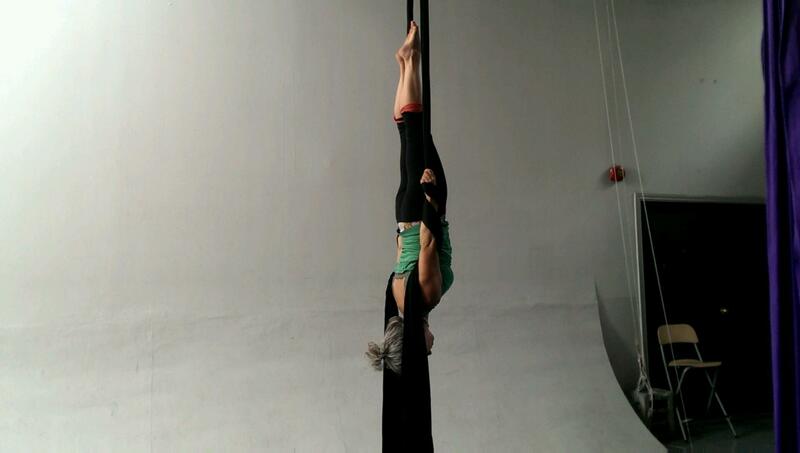 This class is can be used as an additional conditioning class for those already in an aerial class or to strengthen before moving on to an aerial class. $25 (incl. HST) for Drop-in. Give it a whirl! Learn the basic prerequisite to move forward on hoop in a safe progression. 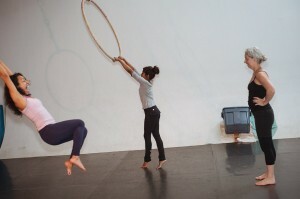 Foundation moves grips, pull ups, lock offs, pulling taffy, sweet spot,and steering the hoop. 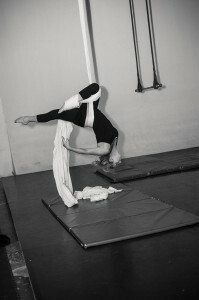 Basic inversions under hoop, mounting hoop, advancing to a family of beginner and intermediate moves. And last but not least learning to work the spin. Exploration will be encouraged! Play and create new moves! 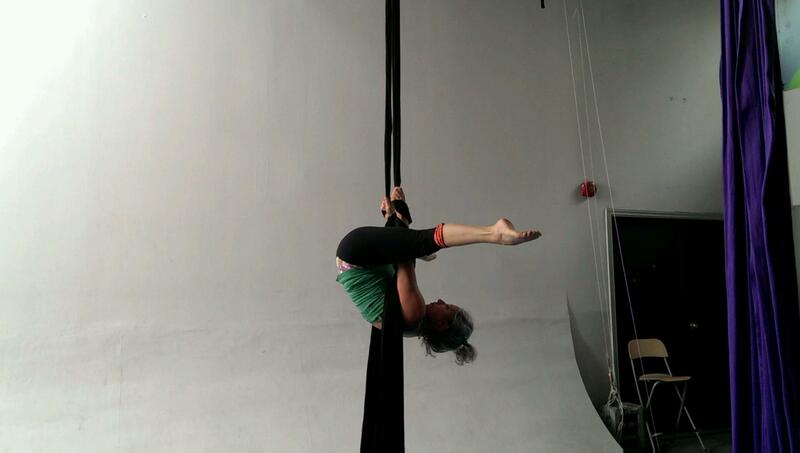 Hang around upside down! Learn transitions and basics to help you understanding all parts of the trapeze/Silks, proper grips, how to hang, shoulder positions, getting on by using tucks and inversions. 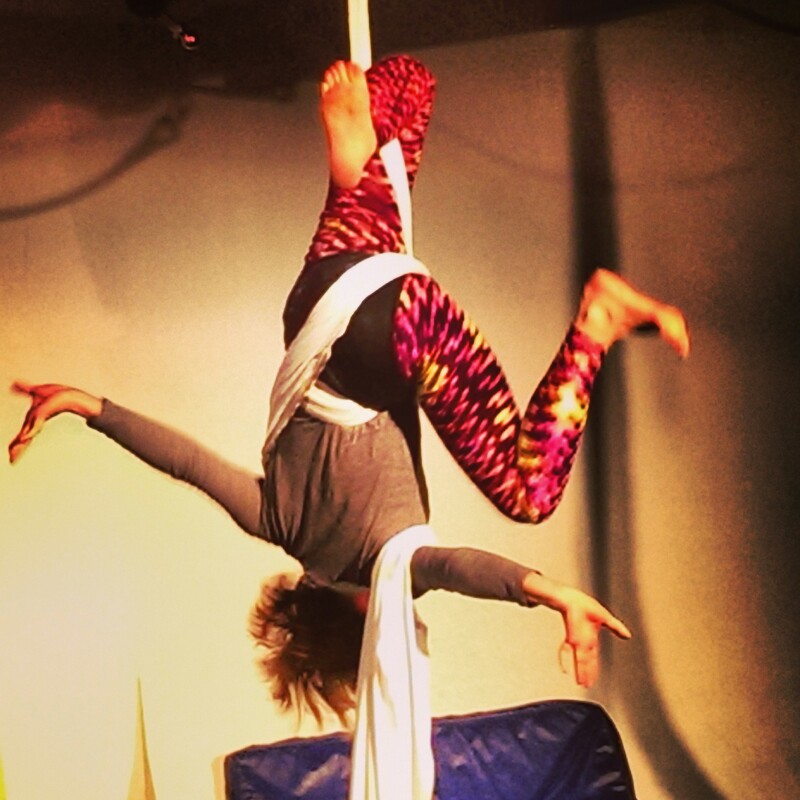 Exploring different parts of the trapeze/silks on, under and around. Moving forward to basic moves on equipment and working toward a sequence of moves that can be used in a routine to music. There will be creative exploration using transitions from ground to air keeping movements flowing from one trick to another focusing on proper form. Learn to Fly! You will be mastering the basics moves of climbs, foot locks, inversions and tricks before moving on to more advanced moves as you improve and get stronger on silks. Progressing to learning sequences of moves that will work towards a routine choreographed to music. Exercises will focus on proper form, power, flexibility and stamina. 8 week session on going - Join any time! 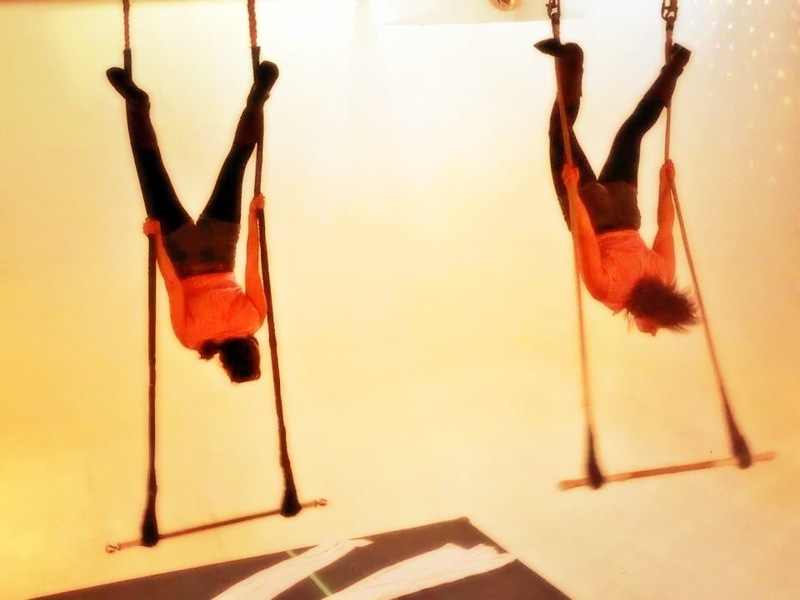 Keep hanging! 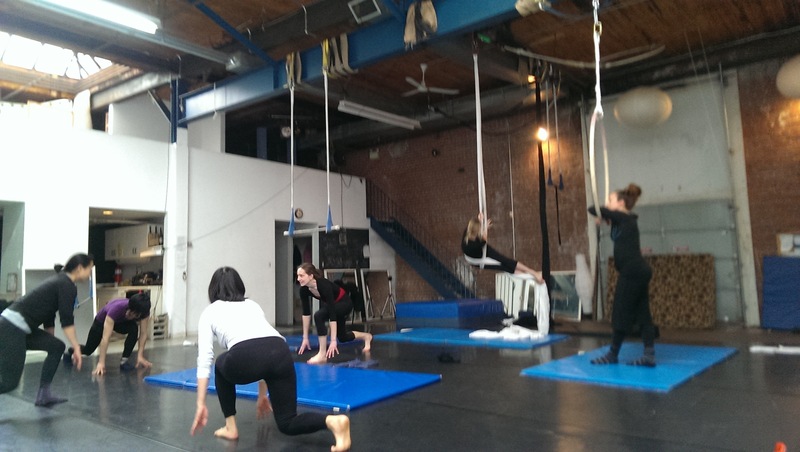 Now that you have mastered pre skills trapeze class. 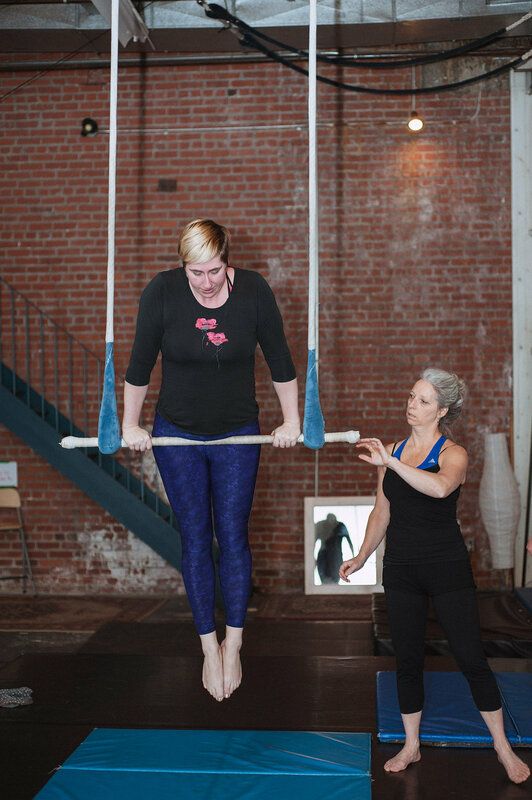 You are ready to focus on proper form and understanding body awareness in Hangs Balances and Drops. Continuing to focus on transitions and character development to work towards using in a choreographed routine to music. This class is designed for advanced students working along side the instructor in a circuit style of class. 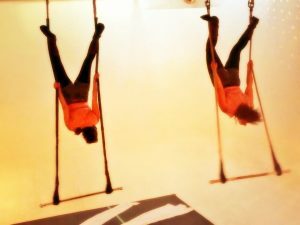 We will focus on stretch and strengthening conditioning in the air on all the equipment (trapeze, hoop, silks, rope ect..) and the ground. Using a partner as needed in some of the exercises and stretches. This will help you as you move forward to learning more advanced moves with a focus on proper body alignment and form. Take it to the next level! Create your own routine, continuing to learn intermediate tricks and using tricks that you already know or are focusing on in other classes. Developing a character for your routine that will have transitions from ground to air and keeping movements flowing from one trick to another. You will also learn how important it is to use the fabric to its fullest. It can fly / float too! $35 (incl. HST) for Drop-in.